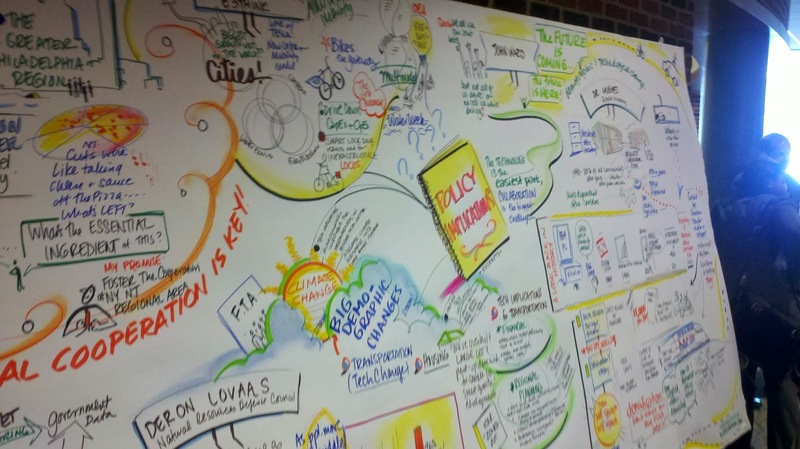 The Delaware Valley Regional Planning Commission (DVRPC) has held its annual Board Retreat and, as usual, has given us some provocative thoughts and thinkers. Andrew Bata of MTA in New York showed us some cutting edge technology in transit, including realtime multimodal information, automated transit, and no-catenary light rail. Daniel Lee of Penn impressed upon us how rapidly new transportation technology, such as driverless cars, is arriving (and entertained the group with a video of robotic soccer!). Sabrina Sussman of ITS America said we are entering the “my transportation” era, when people can use their smartphones and other devices to move around in a wide variety of modes. Just ahead are integrated payments systems, multimodal navigation and trip planning, smarter cities, and connected and semi-autonomous vehicles. John Gartner of Navigant talked about the future of electric vehicles. He believes the EV industry is “vibrant and healthy” and expects the German manufacturers (stimulated by the success of Tesla) to be the key growth market in the next couple of years. Jim Hughes, dean of Rutgers’ Bloustein Planning School, gave a fascinating account of the growth of New Jersey’s “autocentric office corridors” and their relation to the advent of personal computers and a style of office-based knowledge work based on them. That day has now passed, he argued, as we enter an “untethered era” based on a mobile internet technology. Both the new technology and the Millenials who have grown up with it are more oriented to dispersed work and “interactive team spaces” than to the old world of office parks and cubicles. This shift has left New Jersey with an obsolete suburban office infrastructure that is “oversupplied and underdemolished” with “stranded assets” sitting in “seas of asphalt.” He suggested that “densification” is no longer just a planning concept: it is being pursued by private sector executives who find the old model expensive and inefficient. Deron Lovaas of the National Resources Defense Council pointed out the interconnection between new technology and climate change preparedness. Tom Glendening of E3THINK described new developments in urban mobility, including new bikeshare technology and a new bike-boat-bike trans-Hudson intermodal system under development in New York and New Jersey. How do all these ideas link up? See the board below! On a nontechnical note, Jim Simpson, New Jersey Commissioner of Transportation (and DVRPC Board Chair) recounted some of the frustrations he has experienced in New York/New Jersey relations and said he intends to use the example of Pennsylvania/New Jersey cooperation (facilitated by DVRPC) as a model for improving bistate problems to the east. DVRPC also presented its Regional Excellence awards (described here), including one of my favorites, the new Pennsauken Transit Center, which provides a connection between NJ Transit’s Atlantic City Line and River Line (story here). Networks are good! Congratulations to Barry Seymour and company for another outstanding program in cutting-edge transportation planning! Just a year after Sandy, and scientists are giving us some pretty glum predictions about future flooding possibilities for the middle of this century. Rutgers and Tufts scientists have just published a study (link here) suggesting that sea level could rise by 1.5 to 2.3 feet at the shore by 2050. In addition to climate change (including changes in the Gulf Stream), other factors at work include such esoteric forces as sediment compaction and adjustments following the last ice age! You would have thought climate change was scary enough! Fortunately, planners in New Jersey and elsewhere in the middle Atlantic area are taking the issue very seriously. Still, I don’t think anyone has really mentally processed the enormity of large portions of the densely populated East Coast potentially disappearing into the surf. At a minimum, it seems to me, transportation planners need to seriously focus on building “allweather” transportation systems to provide travel during emergencies. A hundred years ago, that meant paved roads. Now it needs to be much more. U. S. PIRG has issued another report in their series highlighting and documenting the big changes in travel patterns happening in this country. Their previous reports this year – “Moving off the Road” and “A New Direction: Our Changing Relationship with Driving and the Implications for America’s Future” (my comments and links here and here) pretty persuasively argued that the changes we are seeing in travel – especially falling VMT – are not just a product of the current economic slump but are serious, long-term changes that we as a nation have not yet come to terms with. The new report, “Transportation in Transition: A Look at Changing Travel Patterns in America’s Biggest Cities” (available here), pushes the analysis down to the level of urbanized areas, using data from the Census, FHWA, and FTA. The report tracks similar findings for numbers (and shares) of workers who commute by car to work, who bike to work, and who work from home. The authors also put some more holes in the theory that the economic slump is the main cause of these changes. They matched up various indicators of economic distress (increase in unemployment rate, increase in poverty level, etc.) with indicators of change in travel patterns and found a negative correlation. In other words, those urbanized areas that have weathered the economic crisis relatively well have tended to show more change in travel patterns (drop in per capita VMT, increase in transit, etc.) than their less successful cousins. The real fun (I know, this probably falls into the “get a life” category) is in diving into the tables at the back of the report, which list scores for all the urbanized areas analyzed. (Not all urbanized areas are scored in all categories due to problems with availability and comparability of data.) Perhaps not surprisingly, these data show all kinds of local divergences and anomalies, perhaps explainable by differences in economies, demographics, transit policies, etc. · In Pennsylvania, Harrisburg, Pittsburgh, and Lancaster all rank highly in the metric of decline in per capita VMT (4th, 5th, and 11th). However, while Harrisburg also ranks high in increase of transit passenger miles per capita (5th), Pittsburgh and Lancaster rank poorly, showing actual declines in that number. · In Massachusetts, Boston doesn’t rank highly in either VMT decrease or transit increase, but ranks 7th in the nation in increased bike commuting (Hubway effect?). · In New York, Poughkeepsie-Newburgh scores near the top nationally in VMT decline (6th) and increase in working at home (6th), but near the bottom (83rd) in increase in transit passenger miles per capita, with an actual decline in that category. · In Wisconsin, both Milwaukee and Madison are near the top in VMT decline (2nd and 3rd) and also in increased bike commuting (19th and 2nd). The example of Madison, which already is a very bike friendly city, suggests that we are nowhere near saturation levels for bike commuting anywhere. · The Washington DC urbanized area (including significant populations in Maryland and Virginia) scores at middling levels on most of the indicators, but ranks 14th in increased bike commuting share (Capital Bikeshare?). Congratulations to Phineas Baxandall and company at U. S. PIRG for putting together a compelling report that should be required reading at state DOTs, MPOs, and planning firms! Parking is one of the great untamed monsters of transportation and land use planning. There are no easy answers (that I have seen), although more transit, better walkability, reduced parking requirements, pricing parking, and of course mixed use development all help. Congratulations to Strong Towns for taking on one aspect of the monster: the fact that developers and towns often size parking fields to meet the alleged demands of the greatest parking demand day of the year – black Friday. 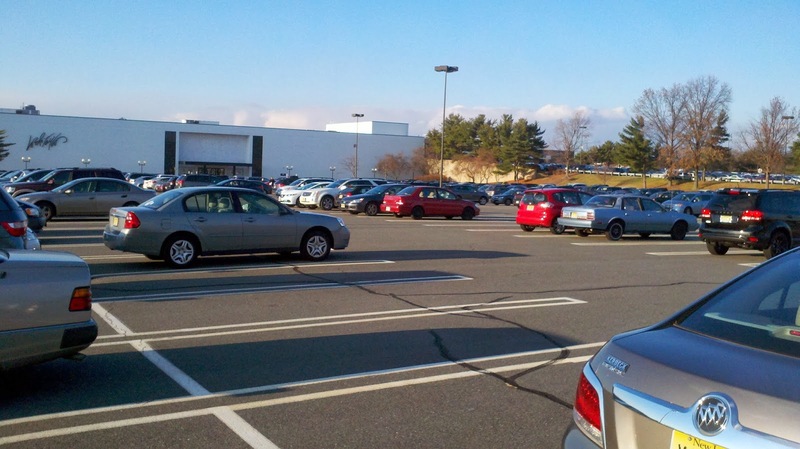 Smarter Towns invited readers to send in photos demonstrating that, at least in many places, even black Friday parking spaces are way in excess of need (see #BlackFridayParking). 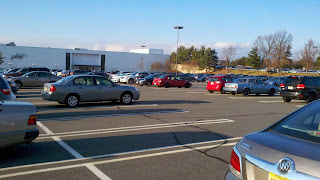 My shot (below) is of Quakerbridge Mall in Lawrenceville, NJ (between Trenton and Princeton) at 3:00 on Friday afternoon.